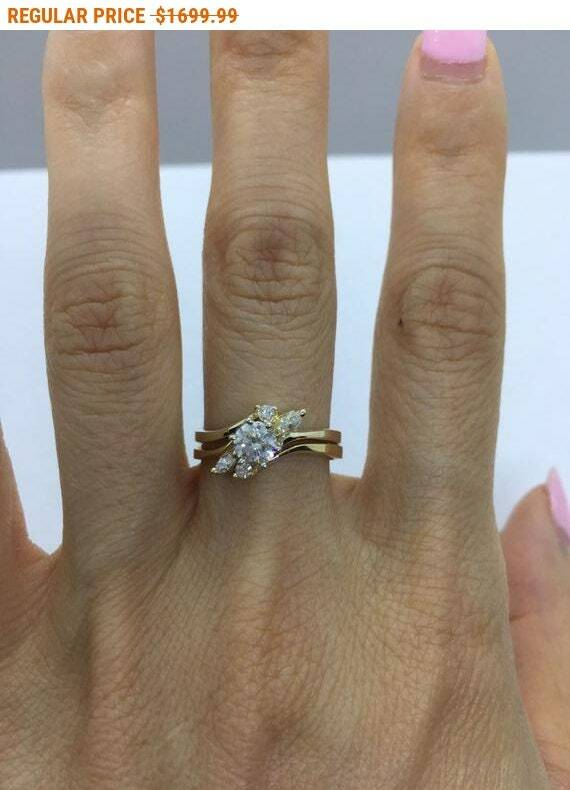 Very sparkly engagement ring set features an 0.40 carat diamond center with 4 accent diamonds (2 marquise 0.11 ctw and 2 round 0.07 ctw) Total diamond weight is 0.59 tcw. Very nice set. Center diamond is held in place by a secure 6 prong setting. Rings are made in USA. 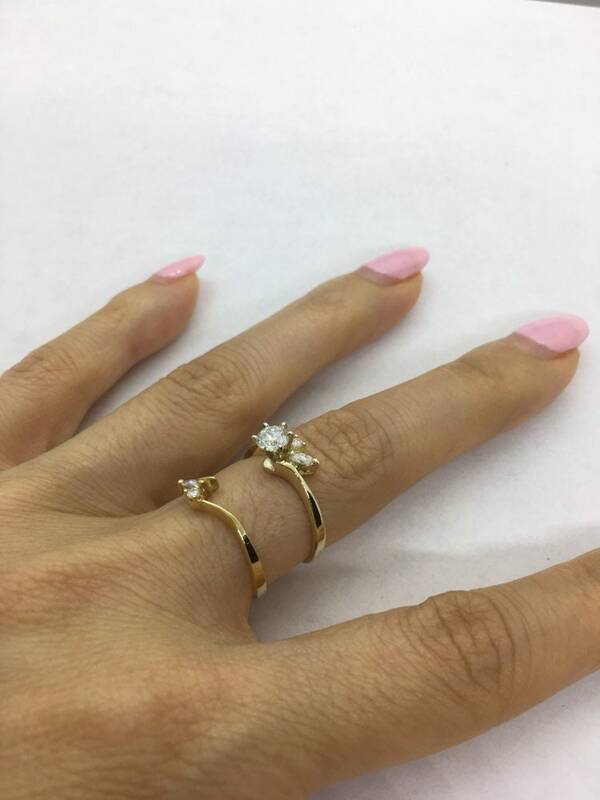 Solid 14k yellow gold. 100% authentic and natural diamonds. Diamonds are all SI clarity and clean. Over 43 years in the jewelry business. Our reputation is everything. All items are as described and guaranteed authentic. We focus on the big look at an affordable price. We do not use lab created or imitation stones. We use a high quality gold mix. We have a retail shop and are located in Downtown Los Angeles, California USA. Returns accepted on standard items. 10% restocking fee applies. Custom items are not returnable but we will try to work with you to make the item right. Please check out Etsy store reviews. We have many very satisfied customers. Items will not ship until payment is made in full. We offer payment plans and no interest financing. Please contact me for more details. We offer AfterPay’s Shop Now, Pay Later for up to $1000. This service is free of charge and allows you to make 4 interest free payments. Or Klarna financing up to $10,000 with low or zero percent interest. I require a valid phone number and ship every order with signature confirmation. Returned or refused packages are subject to a $25 administrative fee and original shipping charges are not refundable. I will deduct the actual cost to ship the item from the refund. If you want expedited shipping, please contact me for a quote. You, the buyer, will be responsible for the difference. Combined Shipping - Please contact me. Items are shipped out of our Los Angeles Office. You may opt to make arrangements to pick up the item in person. International Orders - The buyer is responsible for customs and taxes that may be incurred. Please contact me within 3 days of receipt to initiate a return. Custom items may not be returned. If you are unhappy with your custom item, I will work with you to make it right. Any new changes or modifications to the piece after purchase may incur a nominal fee. We do not accept used returns. Please contact me in advance for all details. 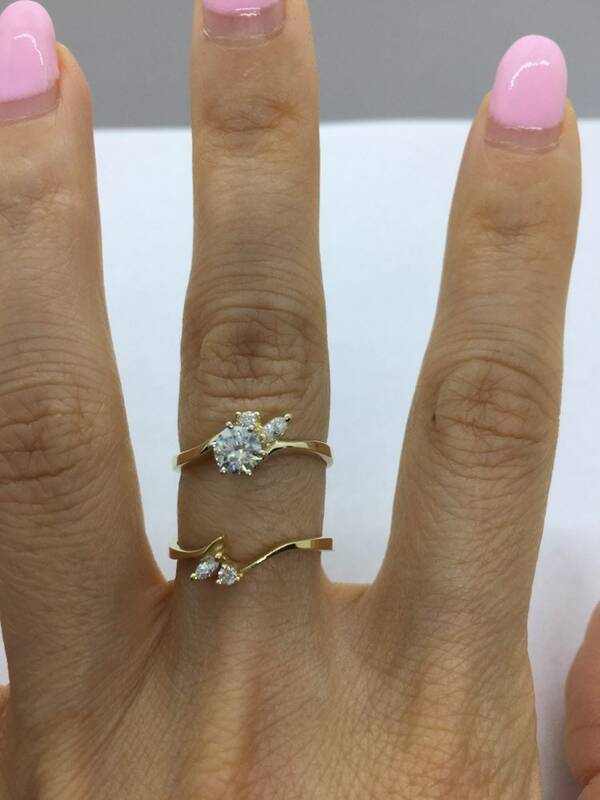 All items will be inspected by our onsite gemologist. If we deem the item has been altered in any way, the return will not be accepted. Buyer is responsible for return shipping charges unless the return is a result of our error. If you send us an item that is deemed used or altered, you will not receive a refund and must make arrangements to have the item picked up or delivered back to you. Items left over 90 days will be disposed of. If you are interested in reselling my items or wholesale purchasing, please contact me directly. We work with many local jewelry shops and sell gemstones (including diamonds) for wholesale. I offer laser engraving on items that have enough room for it. Please message me for details with the text or symbols you require. The price varies. 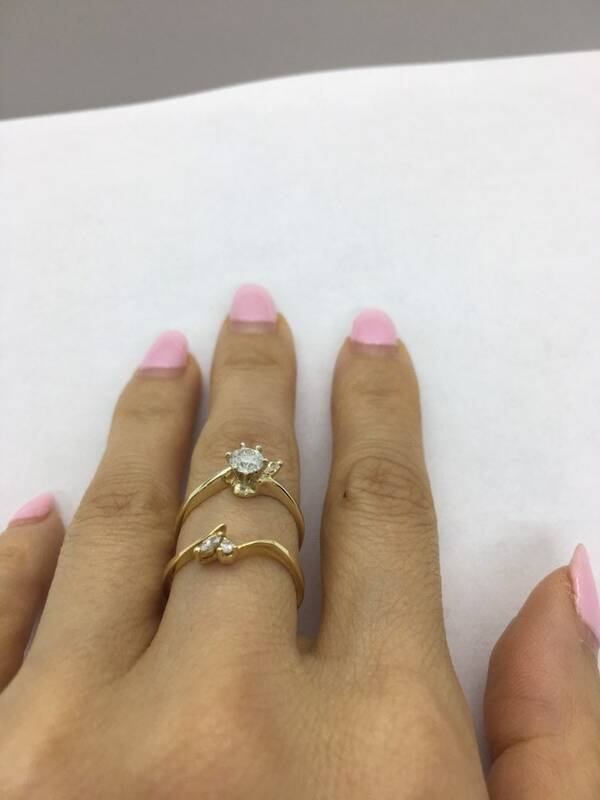 I highly recommend you visit a local jeweler to get professionally sized. It is the correct and proper way. You should also let the jeweler know if you are purchasing a wide band or thin ring. I am happy to provide volume discounts. We currently manufacture and sell to other jewelry stores. If you wish to make your own designs or carry some of our styles, contact us at 213-623-8028 or luxinelle@gmail.com. We also wholesale gemstones including diamonds if you are looking to purchase in quantity. We have lots of references. Items come standard with a matching box. Example ring will come with a ring box, earrings will come with an earring box etc. If you wish to include a special message or note, please let me know. I will do my best to accommodate you.